Croda International Plc, the speciality chemicals company who creates high performance ingredients and technologies relied on by industries and consumers everywhere, today announced the start of its major capital expansion project at its Hull manufacturing site in Yorkshire attended by the local Lord Mayor, MP and Councillors. Croda’s Group Chief Executive, Steve Foots, officially ‘handed over’ the project to Project Manager John Batty for work to start on the investment that will nearly double existing capacity. 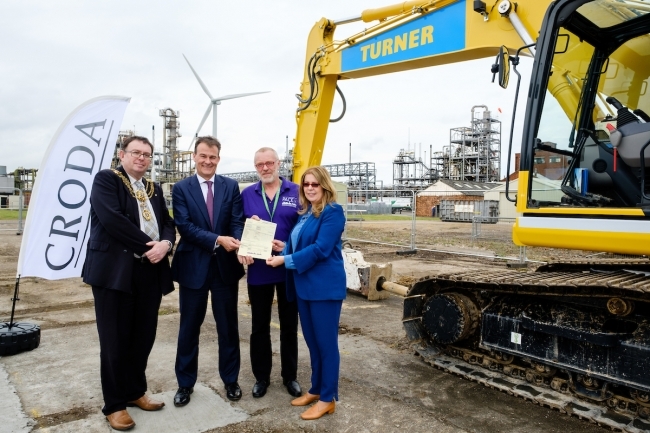 It demonstrates the Company’s commitment to UK manufacturing and will provide long-term job security for the workforce at their facility in Hull and support the local economy during the construction phase. It is in line with the Company’s strategy to invest in faster growth markets, enabling it to satisfy growing demand for its renowned polymer additives. This technology is used by global polymer manufacturers to address issues such as friction, scratch resistance and stability of plastic materials used in multiple industries including automotive and packaging. Justin Williams, Hull Site Director said: “This strategic investment will provide job security for our workforce and is aligned with the Government’s Northern Powerhouse initiative to boost investment in science and innovation. The longer term benefit of this project will be seen across the entire supply chain through a significant increase in the demand for locally grown natural raw materials.